I lie, this wasn’t that hard. 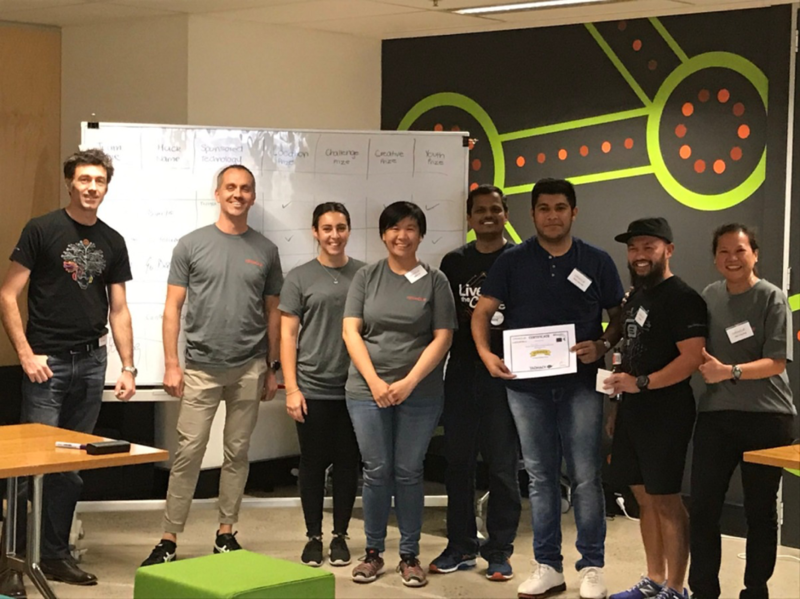 Largely, because I had been introduced to my future team mates by Jason Lowe, Oracle extraordinaire and TADHack regional organiser for down under in the Slack team that was conveniently created for the entire global TADHack participating community. Our team consisted of a hacker (Jagdish Chichria), a hugger (Mei Ling), a hustler (myself, Si Pham), a hipster (Yan Lau) and a student (Rahil Agrawal). We would later assign the student the honorary role of CEO which he performed to a tee. We introduced ourselves to the everyone else as the less well organised scrambled to find emotional anchors in the sea of nervous attendees. I felt pretty well organised at this point. Settling in with a coffee in hand, we listened to introductions from Alan and the global sponsors of TADHack. Being Sydney, we were one of the first TADHacks to kick off as Asia and Europe were still in bed. Things were getting exciting. We couldn’t wait to get started and in the folly of finding a room for the team we chose the one and only room without aircon, ugh! That wasn’t gonna stop us though. The chit chat started and the team was storming! The ideas were flowing and everyone had their say. Plenty of those jelly beans were already making their mark. We started off addressing the most technical challenge but ended up with a consensus view that there was more opportunity to make an impact by addressing the least technical challenge; that of bringing optimism and resilience to kids with serious illness and their families. We utilised multiple whiteboards to identify our shared understanding of the problem and create a plan for the next 24 hours. Once agreed, we were off! 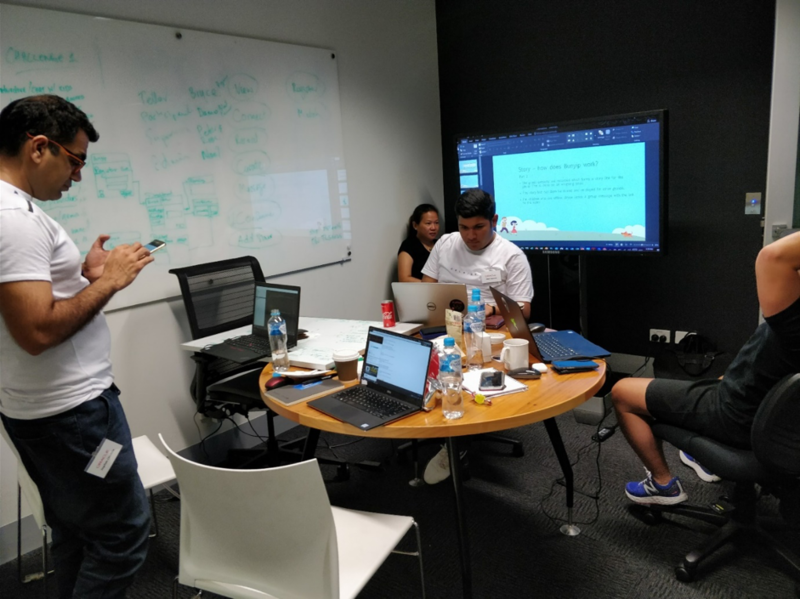 Mei, Rahil and myself starting working on the pitch, Jag and Yan started getting dirty in amongst the APIs – which one to use? There was one way to find out; RTFM. We sought out various mentors to validate our idea and get some advice. There were onsite and remote mentors available to us – the support was so good! 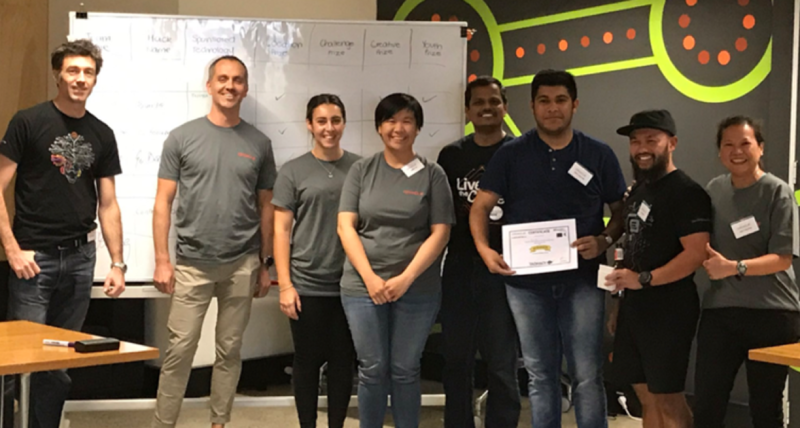 In Sydney we had experience mentors from Telstra and Oracle who were well versed in forming pitches and selling ideas. Since we were using their tech, they were also very helpful with teaching us how to use their APIs and cloud services. Having representatives from the global sponsors online was also extremely helpful as they were able to instantly help us troubleshoot any problems with their APIs. As the business and technical research streams occurred concurrently we continued to refine our solution with new information by the minute. 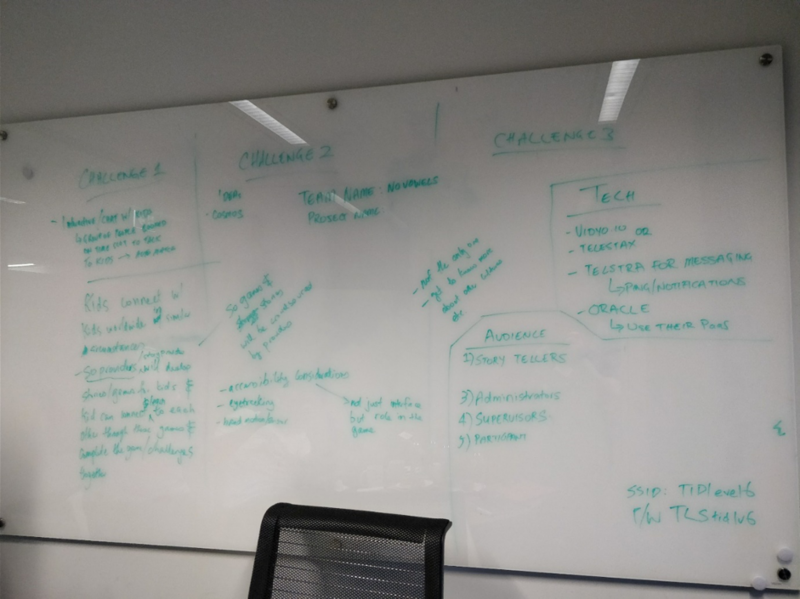 We actually spent all morning and through lunchtime on validation our solution against our understanding of the problem before deciding on the technical architecture. I’d later found out that this was, in fact, a few more hours than some other teams. Lunch felt well deserved and there were plenty of laughs all round. We also assigned team roles and agreed that we all should present in the pitch. For the remainder of day 1 the business stream continued to focus on the pitch and started filling out the slide deck whilst the technical team worked on validating and implementing our chosen components with a couple of people moving between the streams to make sure we were incrementally validating our design choices. As we were being kicked out of the building at the end of day 1 we discussed whether we would continue progress at a nearby office or go back home and work remotely. I felt there was an energy to keep at it deep into the night but perhaps as strangers no one was brave enough to commit to a late-nighter. Needless to say we all just went home. The next morning was a continuation of the two streams: the demo narrative was confirmed by the business stream based on key features and solution benefits and the tricky bits of the implementation was coming together. 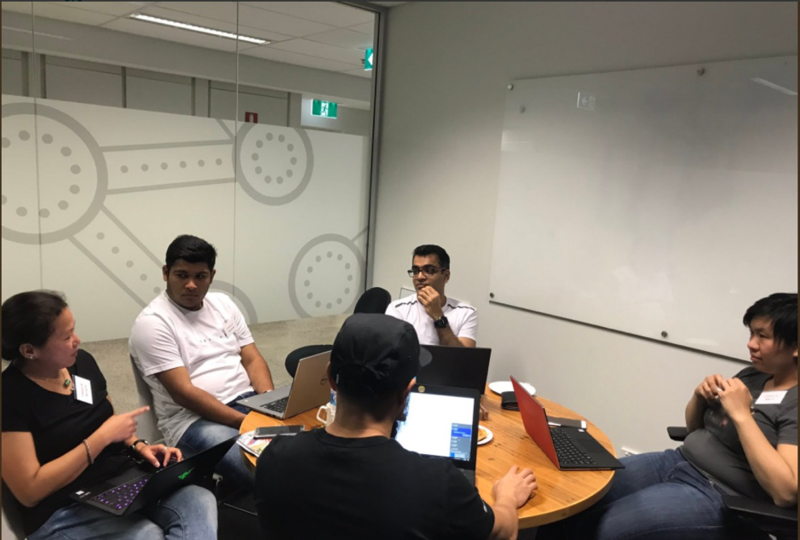 In particular, getting the Vidyo.io session to connect and transmit in coordination with the Telstra Messaging API wrapped in a custom website and content for the website about our team, company and solution, all hosted on the magical Oracle Cloud! We thought we’d have plenty of time but as the hours ticked by we realised that our progress wasn’t as swift as we’d envisaged. Thankfully, a checkpoint with our mentors validated our understanding and our idea so it we were encouraged by that fact. Our solution was rock solid and our narrative was simple yet evocative. So, we were gonna have to mock some parts of the demo. As more and more little bits of the implementation moved to below the line, we started to assign sections of the pitch deck until the demo implementation was good enough! With a little over 30 minutes to the submission time we dropped what we were working on and started rehearsing. Our first run we discovered we should probably write our spoken text down! On the second run through we realised we forgot to keep time. On our third run we realised we were over time and brutally culled! Someone then asked whether it’d be a good idea to practice on stage so that we’d get as close to ‘production’ as possible – good idea! A short bit mad dash to to the stage to discover we were the first ones out of our working rooms and seemingly the most organised. We setup out demo laptops and found our places to stand on stage. We tried to get once through and realised we’d have to use postman to ‘smoke n mirrors’ a certain step of the demo. We decided to send SMS messages to all the judges for, you know, maximum impact! Even so, we were fumbling around with the REST call in Postman and the API docs and some choice words ensued. “Let’s just go first” someone suggested. Yes, let’s just get it over and done with. We practised, practised and practised. Now it was time. All the other teams came out of their rooms and gathered in front of the stage. The judges gave an address and stated the timing limits. AV was working and suddenly we were underway. The speaker before me got stuck and the room fell silent. I was willing him to get back in the flow. As the microseconds of hesitation ticked by, my nerves started to unravel. Alas, he got it together and we were flowing once more. Then it was I that stepped forward. And with that it was all over. Time to crack open the beers and enjoy what impressive ideas the other teams had hacked too! Helping organisations that help many families affected by children with medical conditions. There are plenty of not-for-profit organisations that help engage and educate children about different medical journeys like cancer. They rely heavily on the generosity of its volunteers. They also use storytelling through shows using actors and puppets. There is an opportunity to extend the reach of these productions through the use of technology providing a similar experience for children and their families. It will allow these organisations to help more families, not just in urban regions but also rural regions as well. Please help bring optimism and resilience to these families living through one of the most traumatic times of their lives. We called our team No Vowels as none of our initals were vowels. Our product was called Bunyip – some large mythical creature from Australian Aboriginal culture which has been adapted into white Australian culture. Our Solution was to use interactive story-telling to build resiliance and optimism of children and their families by connecting and matching story tellers with sick kids. We used Vidyo.io to host video conferencing with Telstra’s messaging API to send offline notifications. You know what? We won! What a great feeling to be part of a group of really joyous people who were strangers only a day ago! It really felt like a team effort – like a university group assignment again, but that actually went well. Even though we did win, we asked one of the judges for their feedback and they were very kind in giving it, both good and what could improve. There were even a few things we had mused about but left out of our pitch that we should’ve covered – market research, a revenue model, business plan and a clear future roadmap. The good bits what we did do well were effective story telling of the problem and the benefits, sticking to the allotted time, a fully demonstratable solution and a well presented pitch which involved all of the team members. Go team! Since, we’ve mostly stuck together and we’re moving the idea on. 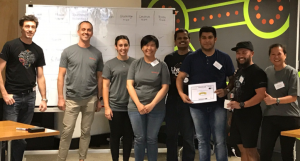 It’s hard to keep the hackerthon momentum going – not surprising there – but a corum of the team has moved on to other hackerthons and have done very well. I feel like there’s a good opportunity for out Bunyip product to converge with some other ideas that No Vowels team members are working on as well and with some careful coordination we’ll pitch for an incubator in the future. We’re learning heaps of team, technical and business skills and meeting hackers, hustlers, huggers and hipsters of all persuasions! The networking and exposure to the companies and organisations that are responsible for these hackerthons promises to open new pathways too! Two big thumbs up to Alan, Jason and the rest of the TADHack mentors, sponsors and organisers for putting on a thoroughly good show indeed! I’ll be coming back for sure.